It shouldn't be a surprise we're posting another adobo recipe. Filipino adobo, that is. We're a big adobo family, after all. And, I've made no secret of my dislike of too-wet-and-too-saucy adobo, especially when it comes to chicken adobo. I don't like chicken skin that has been sitting in liquid for some time. Which is why, one day puttering about the kitchen, I decided to take a new approach to the dish. I didn't want the labour-intensive way of doing it, aka simmering chicken and then broiling, as we've done in the past. I took my chicken pieces, got a big roasting pan, and poured my adobo marinade in with the chicken. I let the chicken pieces sit for about 30 minutes, turning them over to make sure every part is coated. For the garlic, I peeled some cloves and dumped some cloves unpeeled. I then put the pan into the oven, at 350F degrees, for about 45 minutes, and then cranked up the heat to 450 for the last 15 minutes of cooking. As there is still too much adobo marinade left in the pan, I took out the chicken pieces and reduced it to form "adobo jus." I then drizzled the adobo jus on the chicken pieces. 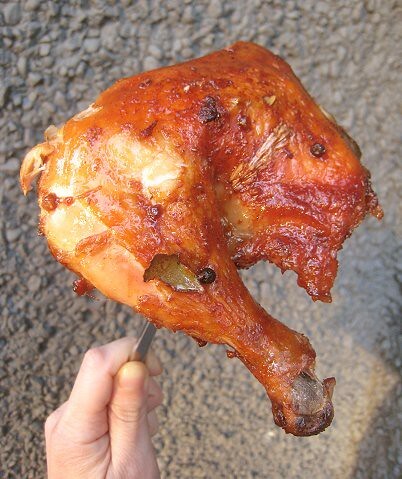 This technique resulted in very tender, juicy chicken pieces, with a nice crispiness and crunch to the skin. As well, there's the bonus of roasted garlic cloves, adding a delicious stickiness to the sauce. All in all, a great adobo! Enjoyed this post? Why not subscribe to our blog? Subscribe via reader or subscribe via email. Thank you! 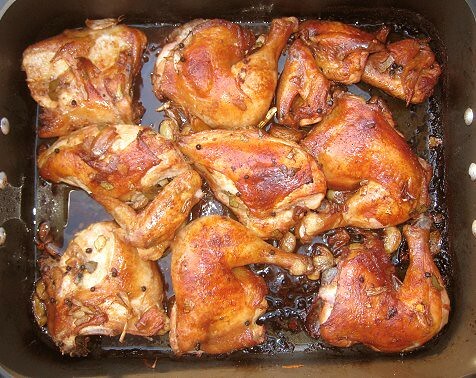 Place chicken in large roasting pan. Ideally, the chicken pieces should form just one layer. Pour over all the ingredients (except garlic) and let chicken sit for 30 minutes, turning occasionally to coat every chicken part. Roast the chicken for approximately 45 minutes. Turn the oven temperature up to 450F. Roast the chicken for about 10 to 15 minutes more, until cooked through and the skin is crisp and browned. If you wish, take out the roasted chicken parts out of the pan and set aside. 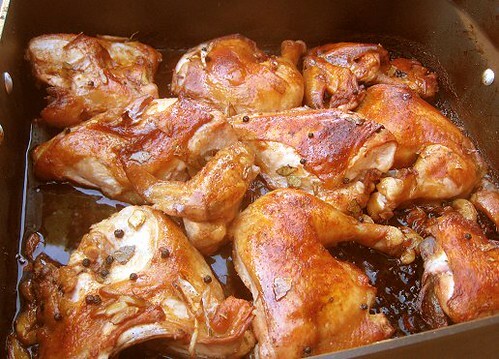 Reduce the marinade and chicken juices in the pan until slightly thick, or to desired consistency. Pour "jus" over roast chicken parts. Enjoy over plain rice. 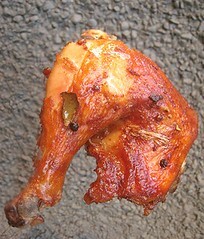 Looks so good..those crispy skin, yummy! I always love reading your adobo recipes, and this is no exception. The color on those gams is breathtaking. 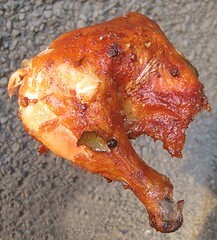 And yes, sometimes I describe roast chicken as "breathtaking", and feel no shame in that fact. For some reason, we haven't tried making adobo with a mixture of meats yet. We should at least try the pork + chicken combo! And these certainly taste different from regular ol' roast chicken. 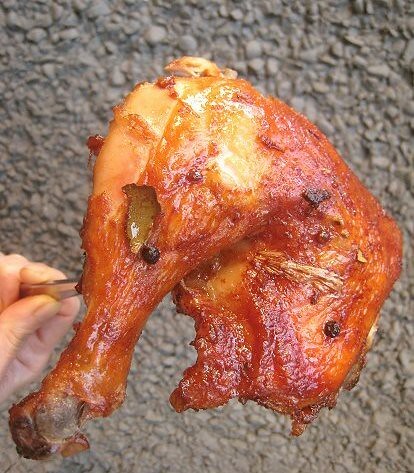 This chicken looks so flavorful with a crispy skin. The best combination!! That dish looks delish! I normally make adobo to go with mackerel but I've never tried it on chicken. One to do. Oh, with mackerel! We've actually never tried that before! We love mackerel here. Must try. One of my favorite Filipino dishes! Stewed chicken in vinegar and soy sauce. Great recipe! Really 2c. vinegar? Or a halfcup? 2 cups. =) The tangy flavor is quite prominent. Just made this and it is so fool proof and amazing. I wasn't too familiar with adobo before this but I am completely sold now. Great recipe, thanks! This is fab. I used the leftover juice as a marinade for firm tofu for a salad later, really tasty. Awesome! In last ten minutes, I smeared honey all over the skins. Browned up crispy AND added a sweetness to it! Thanks for sharing this!! Thanks for telling us how it went! Glad it worked really well for you. Oh, I never thought of that. That's a great tip! Do you dice the birds-eye chilis or keep them whole? It depends how much heat you want. For milder heat, keep them whole. For more heat, shop them up.